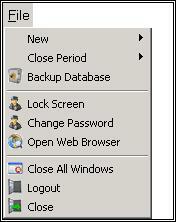 The Home page in Control 4.x is a dashboard with the different navigation elements as instruments. (You can read more about dashboards and Instruments in the Control 4 Changes Guide and the Control 4 Instruments Guide.) The Home dashboard is accessed by clicking on the Default Home button in the top left of the screen or by clicking the arrow next to the Dashboard button in the Toolbar. 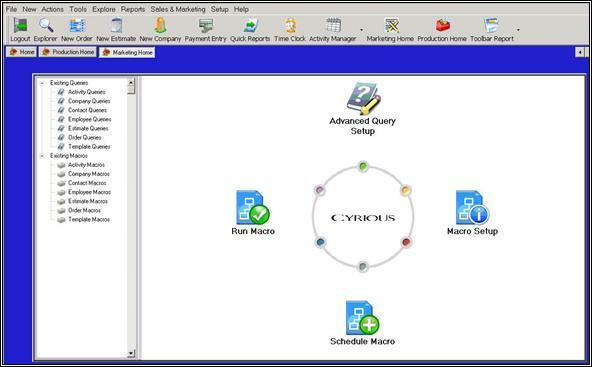 The default home screen button will appear at the top of the screen, below the menu/toolbar, when you are working in Explorer or any of the other areas in Cyrious. The Quick Products options appear to the left of the Home. There are a few more instruments on the default home dashboard; these are the Shortcuts instrument, the User Time Clock instrument, the Time Clock Employee List instrument, and the Tips instrument. The Control 4 Instruments Guide has more information on customizing dashboards for your personal use. The Action Toolbar appears on the right of every screen. 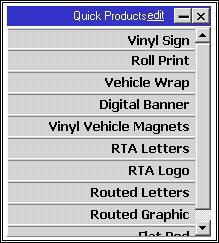 This toolbar allows the User to make certain choices, such as save, print or edit, with respect to the information on the data entry screen. Any active portion of the toolbar appears in color. Any inactive portion appears gray. You will learn about these advanced actions later in the manual. < < SAVE < Saves all entered information. < < CLOSE < Closes an unedited screen. < < CANCEL < Disregards any changes and additions made to a record. < < EDIT < Enters a mode that allows previously saved information to be changed. < < CLONE < Duplicates a pre-existing order, estimate, or product to a new record. < < STATUS < Opens a sub menu to view or change the status of an order. < < VOID < Cancels an estimate or product from the database. < < PRINT < Prints the selected item such as an order, estimate or company details. < < NEW < Creates a new record in a new screen. 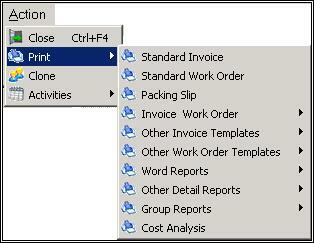 < < EXPORT < Export information for access in another program format, such as Text, XML and XLS. This will bring up a pop up window verifying that you want to continue with the procedure. This procedure takes up quite a bit of time and will disable that particular computer from using Control until the procedure is complete. Close Week Finalizes the week's financial records. Any other payments entered will show on the next business week's records. Opens a prompt to print reports. Close Month Finalizes the month's financial records. Any other payments entered will show on the next business month's records. Close Quarter Finalizes the quarter's financial records. Any other payments entered will show on the next fiscal quarter's records. Close Year Finalizes the year's financial records. Any other payments entered will show on the next fiscal year's records. Close Export Period Finalizes the export period's financial records. Any other payments entered will show on the next export period's records. Close Royalty Period Finalizes the royalty period's financial records. Any other payments entered will show on the next royalty period's records. You can configure Cyrious to send your information to your bank when you close. Unclose Day Reopens the current day's financial records. Any other payments entered will show on the current business day's records. Unclose Week Reopens the current week's financial records. Any other payments entered will show on the current business week's records. Unclose Month Reopens the current month's financial records. Any other payments entered will show on the current fiscal month's records. Unclose Quarter Reopens the current quarter's financial records. Any other payments entered will show on the current fiscal quarter's records. Unclose Year Reopens the current year's financial records. Any other payments entered will show on the current fiscal year's records. 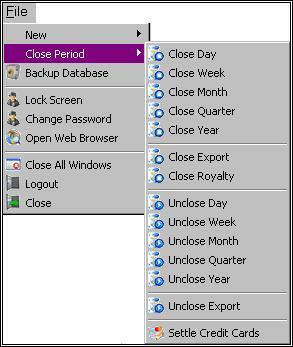 Unclose Export Reopens the current export period records. Any other payments entered will show on the current export period's records. Settle Credit Cards Finalizes the day's credit card processing records. New Company Opens a screen to create a new company. New Order Opens a screen to create a new order. New Estimate Opens a screen to create a new estimate. New Service Ticket Opens a screen to create a new service ticket. New Vendor Opens a screen to create a new vendor. 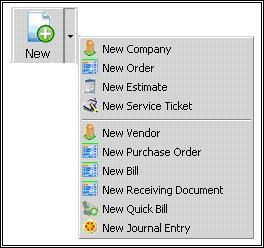 New Purchase Order Opens a screen to create a new purchase order. New Bill Opens a screen to create a new bill. New Receiving Document Opens a screen to create a new receiving document. New Quick Bill Opens a screen to create a new quick bill. New Journal Entry Opens a screen to create a new journal entry. The content of this menu will vary depending on the screen you are working in. You will learn about the various actions that will appear throughout this manual. 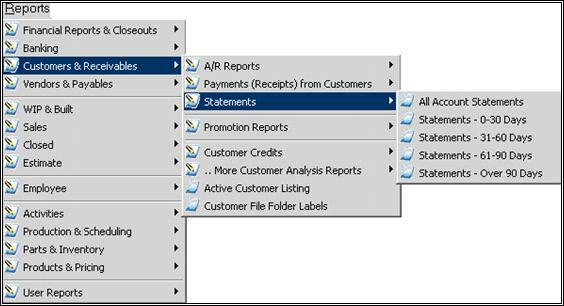 Quick Reports Opens the Quick Reports screen. dashboards Contains a sub-menu with a listing of all available dashboards (more information on dashboards can be found in the Control 4 Instruments Guide). 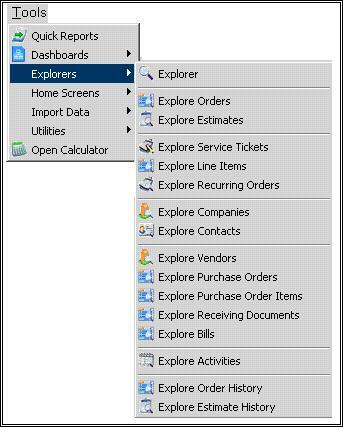 Explorers Contains a sub-menu with a listing of all available explorers. Home Screens Contains a sub-menu with a listing of all available home screens. 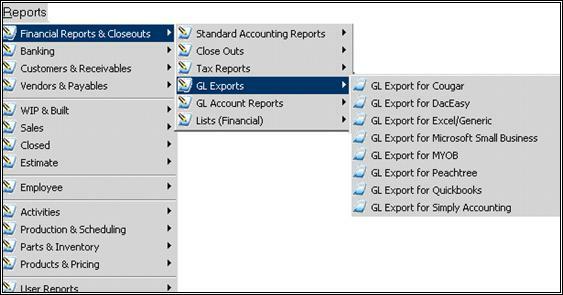 Import Data Contains a sub-menu with a listing of all available methods to import data files. 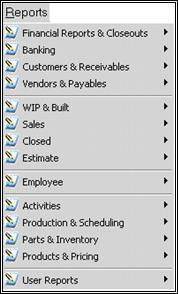 Utilities Contains a sub-menu with a listing of available utilities. Open Calculator Opens a calculator. dashboards are a new addition to the Cyrious Control program. 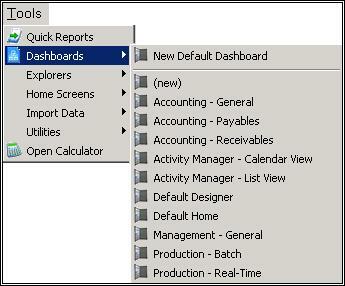 There are several default dashboards available for your use, or you can customize your own (more information can be found in the Control 4 Documentation dashboards Guide). Explorer is Cyrious Software's powerful search engine. 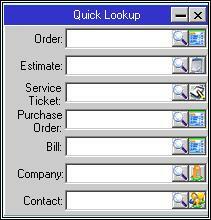 With it, you can locate various types of records, such as orders, estimates, service tickets, and contacts. See users_manual_ch_09-explorer for an extensive review of how to best use this valuable tool. 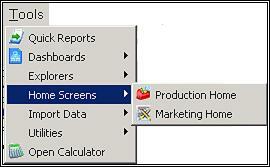 The Home Screens menu contains a link to the Production Home default dashboard and the Marketing Home default dashboard. Import from Text Files Opens a screen to import data and templates into Control. 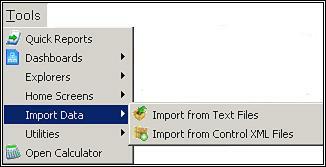 Import from Control XML Files Opens a screen to import products into Control. Move Orders and Estimates to History Opens a pop up window with options for auto archiving records. Archiving moves records to your history. You can access them by performing one of two History searches in Explorer. 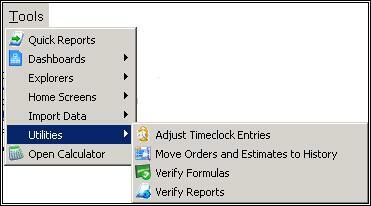 Verify Formulas Opens an evaluation tool that will check all formulas you have set up in your system. Click the button on the right to save this log. Verify Reports Lists all reports with broken links or invalid system reports. VERIFY FORMULAS may take a long time to complete, depending on how many formulas you have set up. You may choose to wait until the end of your business day to use this option as you will be unable to use Control until this inventory is complete. 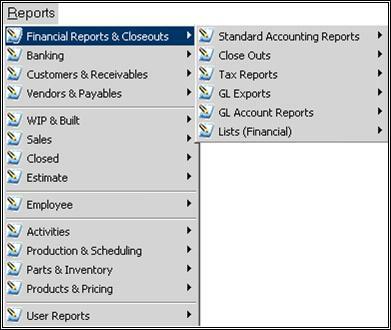 The Reports menu contains sub-menus for each of the options listed. These will be covered in detail in users_manual_ch_15-reporting. Many of the sub-menu options also have a sub-menu with additional options. 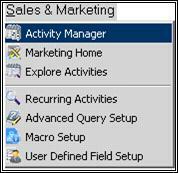 The Sales and Marketing menu options will be covered in detail in users_manual_ch_12-activity_manager. Selecting either the Marketing Home option or the Marketing Home button on the toolbar will take you to the Marketing home screen. 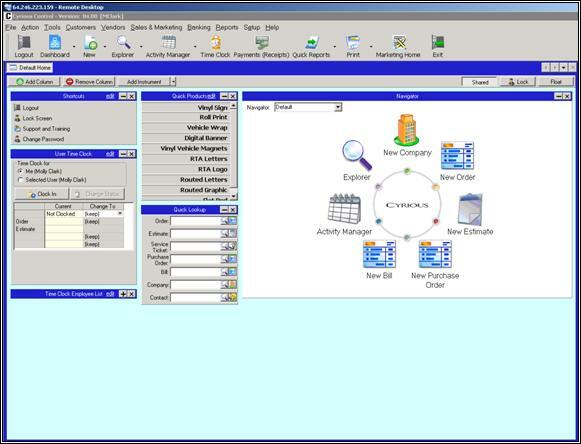 Employee Setup Allows setup of employees and users of the system. System Setup Allows setup and configuration of system wide options. Accounting Setup Allows setup and configuration of accounting options. 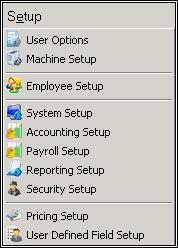 Payroll Setup Allows setup and configuration of payroll options. 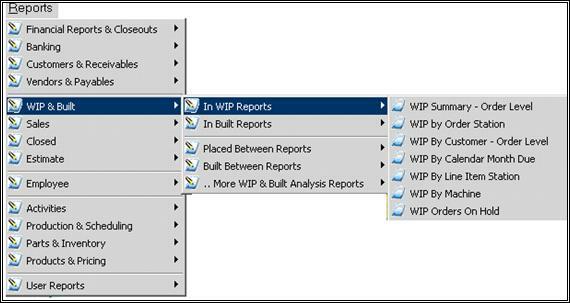 Reporting Setup Allows setup and configuration of report menus. Security Setup Allows setup and configuration of security groups. Pricing Setup Allows setup and configuration of pricing and costing. 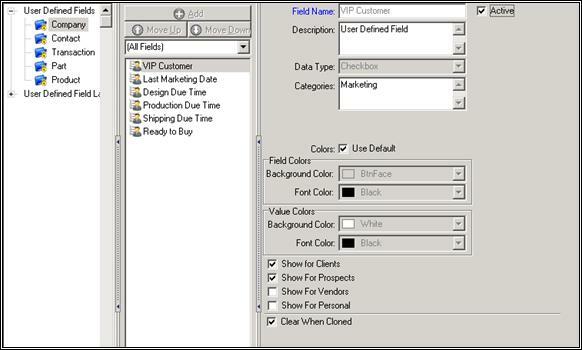 User Defined Field Setup Allows setup and configuration of user defined data fields.